The Future of Back Pain Relief: Stem Cells? For more than three decades, the promise of stem cells has given hope to researchers and patients in search of a treatment for incurable diseases. But time and again, the field has been wracked by setbacks, scandals, and sometimes, outright fraud. Stem cells’ allure comes from their ability to develop into many different types of cells. Because of these properties, scientists have envisioned using stem cells to regrow damaged tissues and organs or to treat neurodegenerative diseases like Alzheimer’s and Parkinson’s. Of the myriad diseases that stem cells might someday cure, back pain and spinal problems have also proven to be popular targets. Scientists are now investigating how stem cells could be used to treat a range of back and spine problems, including spinal cord injuries, intervertebral disc degeneration, or osteoarthritis. Other researchers are investigating how stem cells could improve spinal fusion surgeries. It’s a growing field: In fact, orthopedics accounts for two-thirds of the international market for stem cells and tissue engineering, according to the American Academy of Orthopaedic Surgeons. Orthopedists are primarily interested in mesenchymal stem cells—adult stem cells found in bone marrow or body fat that can turn into new cartilage or bone cells. The field is still very young, and the safety and efficacy of stem cells are still unproven. Just ask the American woman who enrolled in a Portuguese clinical trial testing stem cells as a treatment for paralysis. Not only did the treatment not work, but she later developed a mucous-secreting tumor of nasal tissue in her back. This case is, of course, an outlier—many of the patients involved in the trial actually regained some mobility—but it highlights how much researchers still have to learn about these cells and their applications. That hasn’t stopped doctors from promoting stem cell treatments, nor has it dampened interest from desperate patients with incurable diseases, or professional athletes willing to try experimental therapies to stay in the game. Several high-profile cases have made the news in recent years. In 2014, Spanish tennis pro Rafael Nadal received a stem cell treatment for back pain in which his doctor injected stem cells “in a joint in his spine,” his doctor explained to the Associated Press. Nadal had the same treatment in his knee the previous year. Like Nadal, hundreds of National Football League players have undergone similar stem cell procedures—hoping the stem cells could repair torn cartilage in the knee, speed up recovery after neck surgery, or heal a broken metatarsal, Sports Illustrated reported. Former Texas Governor Rick Perry (and stem cell advocate) received an injection of his own stem cells during a spinal fusion surgery in 2011, despite the fact that such a procedure had not been tested in any major US clinical trial. (Nor had the doctor ever performed the procedure before.) The procedure involves extracting bone marrow or fat, which are rich in mesenchymal stem cells, from the patient, culturing the cells to multiply them, and then reinjecting the stem cells back into the problem area—in Perry’s case, the spine. However, such a procedure is now considered illegal, and the company that cultured Perry’s stem cells, Celltex, has since moved its base of operations from Houston to Mexico. Prior to the relocation, in 2012, Celltex received a letter from the Food and Drug Administration warning the company that they were illegally marketing an unlicensed drug. The culturing process, the FDA argued, turns the stem cells from a tissue into a biologic drug. To provide this therapy, Celltex would either have to conduct very expensive clinical trials, which would take years to complete, and then file for FDA-approval as a drug; or they could simply move the company outside of the FDA’s jurisdiction. They chose the second option. There is a third option, which many US doctors and clinics have pursued. If the stem cells are “minimally manipulated,” meaning they are not cultured before they are reinjected into the patient—and they are not combined with another drug or device—then the FDA considers them to be tissue, and not a drug that requires clinical trials and FDA approval. The result is the widespread use of relatively untested, and potentially degraded or bacteria-ridden stem cell treatments. Not surprisingly, such treatments are considered experimental and therefore not covered by health insurance providers, costing patients thousands and sometimes tens of thousands of dollars, per treatment. But beyond the hype and hustles, there are more cautious researchers who are making progress (albeit slowly) in the field. Mesoblast, an Australian stem cell company, is currently conducting a Phase 3 clinical trial in the US and Europe using their patented mesenchymal precursor cells to treat chronic low back pain caused by degenerative discs. 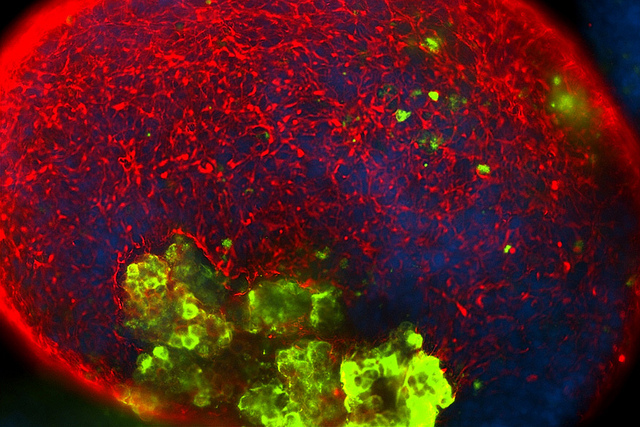 Unlike the treatments described earlier, these stem cells are not harvested from the patient, but are a pharmaceutical grade “off-the-shelf, donor-procured and amplified cell treatment,” according to Hyun Bae, MD orthopedic surgeon at the Cedars-Sinai Spine Center and one of the lead researchers in the Mesoblast trial. The Phase 2 trial found greater reductions in back pain and opioid use among the patients who received the stem cells, compared with the placebo. In Japan, last year, the first human trial of induced pluripotent stem (IPS) cells began in patients with macular degeneration. IPS cells garnered much excitement when they were first discovered in 2006 because they are adult skin cells that have been reprogrammed to act like embryonic stem cells—in that they can turn into any type of cell and reproduce indefinitely—but avoid the ethical controversies that surround the use of stem cells from embryos. While this is exciting progress for the field, even the lead researcher acknowledges that any clinical applications are at least two decades out. But this slow progress is at least an indication of verifiable results and peer-reviewed research, something that is not offered by many of the stem cell treatments you’ll find. For more information about stem cells, watch this video presented by the University of California Television.